From the ground up, a channel with a focus on local news. 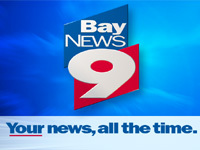 Bay News 9 was the second 24 hour all-local news channel launched by Time Warner after its successful New York 1 changed the way New Yorkers watched television news. One challenge we faced in Tampa was to create a channel that wan't just a clone of New York. In some ways, it couldn't be, because the incredibly spread out Tampa-St. Petersburg-Clearwater market was literally a different world from the five boroughs of Manhattan. I tried to create an identity that was strong and memorable while it held up to nonstop use, in applications ranging from the persistent 'bug' at the bottom of the screen to vehicles and extensive amounts of on-air animation. I'm proud that there was nothing that screamed "cable" or "local" in the look we came up with—it held its own adjacent to affiliates and other, national cable channels. The great advantage for me of creating an identity for Bay News 9 and the later Time Warner newschannels I worked on was that the channel was brand new—it had no history, no bad habits, no "we don't do that this way here." 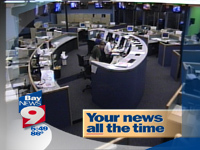 Because Bay News 9 was an early adopter of the DVCPRO format, I rendered all the finished animation directly in the DV25 format, using my Mac, Adobe After Effects, a FireWire cable, and a $2000 Sony camcorder. I believe this was the first animation ever rendered directly to DV for delivery. Image quality? Excellent. 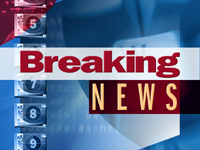 Click here (or on the photos) to see an image gallery from Bay News 9.